A successful civil engineer, Octave Chanute applied his knowledge of bridge building to the design of gliders. Published in 1894, his classic volume Progress in Flying Machines brought together in one book a history of man's attempts to fly. No less important to aviation history was Chanute's role as friend and advisor to the Wright Brothers. Octave Chanute was already a successful American civil engineer in his 60s when he first became fascinated by aviation. In 1894, his studies led him to publish a compilation of early aviation knowledge and history, Progress in Flying machines (republished in 1976). In addition to his significant contribution to aviation as a collector of aeronautical data, in 1895 he began designing and building gliders. These ranged from one using six tiers of wings to the successful biplane design which the Museum's reproduction represents. Mr. Chanute was aided by Mr. Augustus M. Herring, a civil and mechanical engineer, and Mr. William Avery, both of whom acted as pilot in various experimental and demonstration flights. 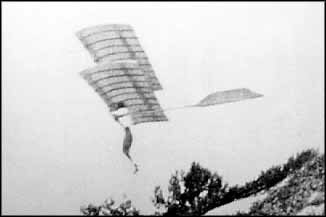 Some of the gliders which Chanute designed and tested had either moveable wings or tail control surfaces; however each relied on the pilot's body movements for proper equilibrium control. During the Wright Brothers' early experiments with gliders beginning in 1900, Chanute offered them encouragement and advice based on his own observations. Chanute's 1897 glider which was flown by Mr. William Avery 84 times at the St. Louis World's Fair in 1904. The craft was built in Chanute, Kansas by Mr. Johnny L. Litchenburg, using materials and construction methods similar to those employed in the fabrication of the original glider. Spruce and Mahagany were used extensively in the original and the reproduction, as well as brazing to join various metal components. One departure from the original techniques was the use of dacron rather than silk as the wing covering for greater resistance to deterioration through age while on display.